Los Angeles, CA – Last night the SAG AFTRA EEO Committee hosted a unique discussion on cultural diversity, martial arts and the evolution of stuntfighting within the film and television industry. 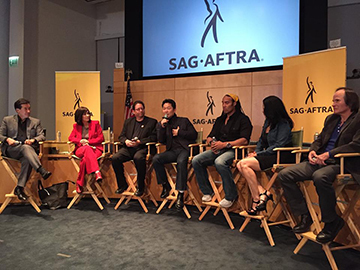 Held at the SAG AFTRA headquarters in Los Angeles, the panel, a who's who of the martial arts industry, featured kickboxing legend Benny “the jet” Urquidez, national forms champion Simon Rhee, Goddaughter of Bruce Lee, Diana Inosanto, Martial Arts History Museum president Michael Matsuda and stuntfighters TJ Storm and Crystal Santos. Jodi Long, Chair of the Los Angeles local EEO Committee and President of the Board of Visual Communications, organized the event and continues to play a major role in changing the media industry and opening new doors for the community. The event, labeled “Diversity in Action,” shed new light on cultural diversity, martial arts in American history, its influence on stuntfighting for film and television and breaking into the highly competitive stunt field. Peter Kwong, star of the film Big Trouble in Little China, lead the 6-member panel as they discussed women in stunts, how to learn stuntwork, the pitfalls of the industry, as well as the many benefits stuntfighting has done in their lives. An introduction to the evening was presented through video by Shannon Lee, daughter of martial arts legend Bruce Lee. “I am so grateful for these types of events. Although the martial arts has been around for thousands of years, in America, it's still relatively new and many of those pioneers such as Benny Urquidez, are still here and are able to share their experiences and what it took for them to be successful in the stunt world,” adds Matsuda. Michael Matsuda is president and founder of the Martial Arts History Museum which was founded in 1999. He is an author of five books on the martial arts and former publisher of Martial Art Magazine. For information about the Martial Arts History Museum, please visit MAmuseum.com. The museum is located at 2319 W. Magnolia Blvd., Burbank, CA 91506. A non-profit organization.